Last week, we discussed the Tarot suits and linked each suit to zodiac signs. This week we are focussing on the Court cards in the tarot deck. The court cards are the people / personality cards. In the normal playing deck, you would have the Jack, Queen and King of each suit. The Tarot deck has the Page, Knight, Queen and King in each of the suits. Most people find the court cards to be the most complex in readings. However, it is best to decide on your reading style and coupled with your gut feel that should give you a better inkling on how to read these cards. There is a lot of literature on the subject. It’s worth reading up on the different methods to find what resonates with you. Wands – intuition, cups – feeling, swords – thinking, pentacles – sensation. It is very easy to find everyday people in your professional and personal life that resemble these personality traits. If the court cards come up in your readings, reflect on who they remind you of. That will give you a clue as to who is involved in the situation. This is only one way of looking at the court cards. Over time, we will look at other methods. Who are you in the court cards? 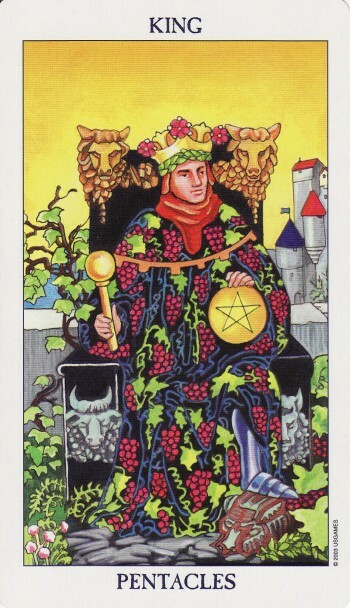 The King of Pentacles represents an authority figure who works hard for business success. This week your focus should be on your goals in your career as well as financial stability. You may want to focus on being influential in your social circles. You will reap the benefits of a pragmatic and steadfast approach. The King of Pentacles is traditionally known as the ‘Midas’ card. King Midas became wealthy but this did not give him complete fulfilment. You are therefore asked to ensure work-life balance. Being a court card, the King of Pentacles embodies the personality traits of ESTJ (see Myers-Briggs method above). He is down to earth, powerful, wealthy, ambitious and has a successful business mind. A person of this nature may enter your life this week or alternatively, you may need to bring these qualities into your own way of life to achieve the goals you are longing for. He reflects security, control, power, discipline and abundance. 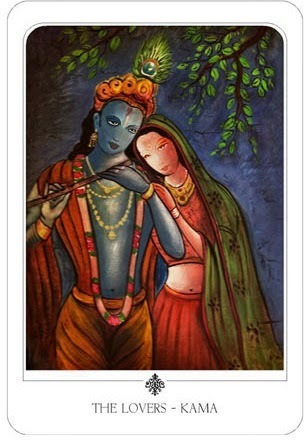 This card popularly signifies the joining of two lovers, marriage, an agreement, friendship, strong emotional bond, ‘ a working partnership’, a reconciliation, joining of forces, attraction, love, union, virtue, harmony, choice, moral strength, responsibility, optimism, creativity, beginning, openness, a soulmate, beauty or trials surmounted. It can indicate a difficult decision that requires sacrifice.